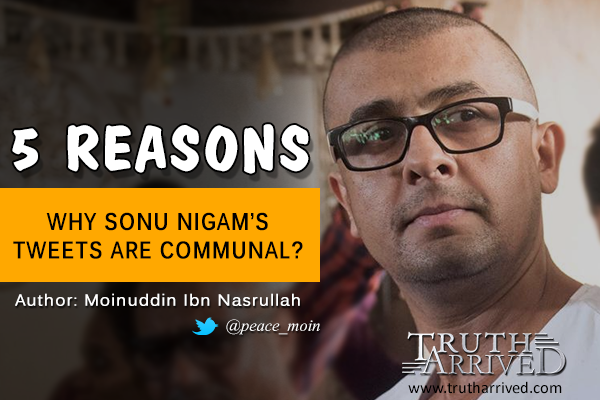 Home / Adhan / Moinuddin Ibn Nasrullah / On The Target / Opinion / Opinion: 5 Reasons why Sonu Nigam's tweets are communal? Some days back we have seen a controversy erupted after Sonu Nigam made an insulting remark on Adhan (Islamic call of prayer). Indian Media as usual picked on it and sensationalized, making it as a breaking news. It not only created chaos on social media, but also the news anchors started debating on this issue as if there was no other important issue than this for the development of India. Nevertheless, this controversial issue got some mixed reactions in which a ‘maulana’ of Kolkata said he will give Rs. 10 Lakhs on shaving Sonu Nigam’s head. Once again media picked up the issue as if the maulana, who has no religious authority, issued a fatwa against Sonu Nigam. Again, there was no fatwa from any institutions or Qazi. But the media successfully incited hatred against the Muslim community. Retweeting Tarek Fatah’s tweets from among the hundreds of replies he was (is) receiving and all the retweets were those who were against Muslims or those who were appreciating him. None of the retweet included who were talking about banning loudspeakers even in other religious places and blocking the roads for religious festivals for days. 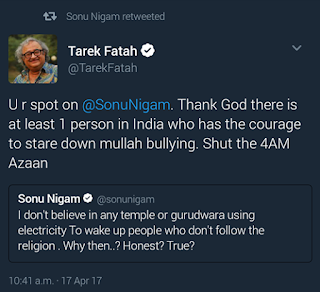 In the tweet, we can easily find out that Tarek Fatah is demanding a blatant ban on Fajr Azaan for morning prayer. Even though you may argue saying retweets are not endorsements, then why didn’t he corrected the tweet when he had an option of quoting the tweet? He could have corrected his opinion – that his opinion includes banning Bhajan Kirtans as well - in that tweet instead of blatantly retweeting. He has only retweeted those tweets that were against Muslims. 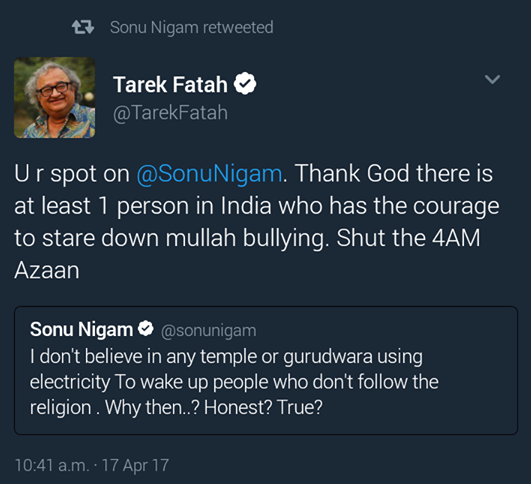 Why Sonu Nigam specified Azaan when he was questioning all religions? There are different ways of expressing ourselves. A public figure needs to be very cautious when he expresses something. What was the need to specifically point out Azaan when he was questioning all the religions? Why were bhajans, kitrans, processions, and road blockage for days are deliberately kept out of discussion? Using the name of Prophet Muhammad ﷺ and unnecessary correlating it to the Edison or electricity is really absurd. What if electricity was present at the time of Prophet Muhammad ﷺ and he would have used it, then will you allow to use the loud speakers in the morning? “I’m not a Muslim and I have to be woken up by the Azaan in the morning.” This statement clearly proves the claim of Aamir Khan who once talked about intolerance. Indeed, intolerance is increasing day by day and the words of Sonu Nigam is a proof for that. It is a common phrase जब खुद का बच्चा रोता हे तो दिल दुखता हे, लेकिन पडोसी का बच्चा रोता हे तो सर दुखता हे. (When our own child cries our heart aches for him but when the neighbor’s child cries we’ll have a headache) This pain at different place for different people is an utter hypocrisy. Why don’t you see yourself? Do you know at public places your music is being played? Many people don’t like it. Yet they tolerate your noisy songs. Whom should we blame? Even if you are not responsible for the music played by someone, but as a responsible citizen you need to convey to your fans and those who play music should respect others and stop playing music on public places. There are people like me who hates your music, yet I have to listen it on public places. Will you tweet it and convey your fans to respect people? Dear Sonu Nigam .. as an atheist I agree with your right to sleep. Will u agree with my right to eat beef ? “Gundagardi hai bus” is a cheap statement from a public figure. It was deliberately used for azaan and to dilute the statement he has included the name of temple and gurudwara. However, the statement of ‘gundagardi’ is largely, or entirely, applied to azaan and Muslim community. This is the reason why only Muslim community reacted to it. The other reason is that, Muslims are being killed and butchered in the name of Cow. They are being lynched by gautankwads (popularly known as Gau Rakshaks). Is this not gundagardi for him? His silence on the other issues and deliberately picking up azaan, that too after growing up listening to it, shows his communal nature. His humanity didn’t wake up by seeing all these incidents but he wakes up during azaan. “When will this forced religiousness end in India”. These were the words immediately after mentioning that he is disturbed by Azaan. Isn’t this his hypocrisy by saying Azaan (or other calls used by religious places) is forced religiousness? Don’t you know there are already laws passed to please a religious community which he or his parents belong? Didn’t he know? To please the people of a particular religion during their festival, sale of Non-Veg food stopped. He is observing all these in his very own country. Isn’t he? But he remains silent on all those issues. Targeting Muslim community and labeling “forced religiousness” doesn’t suit in India. Lastly, I congratulate him the best for his career in politics.